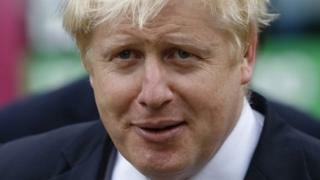 Boris Johnson is seeking to become MP for Uxbridge and South Ruislip, in west London, at next year's general election. The London mayor's spokesman confirmed Mr Johnson is applying to be the Conservative candidate in the safe seat. This month, Mr Johnson announced his intention to return to Parliament. It comes amid speculation he is positioning himself to be the next Tory leader, when David Cameron steps down. Mr Johnson said he hoped to "make his case" that he was the best person to represent the constituency, held by Sir John Randall with a majority of 11,000 at the 2010 general election. "I'm sure there will be plenty of excellent candidates, and I hope very much to make my case to the association," Mr Johnson told the Evening Standard. Mr Randall is standing down at the next election - and local Conservatives have said they expect to have about 100 potential candidates to replace him, although this may come down in number following Mr Johnson's announcement. This will be whittled down to about 50 by Conservative HQ before the selection process begins. The party's candidate for the seat will be announced on 12 September. Mr Johnson has said that if he is elected to the Commons next May he will still serve out his term as mayor, which ends in May 2016. Ken Livingstone also served as an MP for a year after becoming mayor in 2000. Sources close to Mr Johnson told the BBC he was taking nothing for granted in the nomination process. They said the mayor believed targeting a London seat gave him the chance of remaining an advocate for the city while also returning to the Commons. Uxbridge and South Ruislip is a suburban seat on the fringe of west London, covering the commuter towns of Uxbridge, and Hillingdon as well as the villages of Cowley and Yiewsley. The constituency includes RAF Northolt, which played a key role in the defence of London during the Battle of Britain, is now home to the 32 Squadron and other RAF units. The seat is also home to Brunel University, which has 14,000 students. Before himself becoming mayor in 2008, Mr Johnson was MP for Henley for seven years. Mr Johnson's vehement opposition to the expansion of Heathrow is likely to be a key issue during the selection process and, if he is successful, during the general election campaign. He has been the most vocal critic of plans for a third runway at the airport and has backed plans for a rival airport in the Thames Estuary to the east of London. The airport is a source of employment for people in Uxbridge and South Ruislip but, in a 2013 referendum conducted by the local Hillingdon Borough Council, 66% of those who voted said they opposed a new runway. The HS2 rail line between London and the west Midlands is also set to pass through the constituency. The leader of Hillingdon Council, Ray Puddifoot, welcomed Mr Johnson's decision to "put his name in the hat". "He will be an asset to the national party without a doubt," he said. "He is a man of vision, he's the only Conservative of national standard who is solid against Heathrow expansion and that's a major factor in this constituency. "What he has to do now is show the local membership that he will be an asset to the constituency. Boris Johnson's task now is how will he perform locally." Labour's Shadow Justice Secretary Sadiq Khan said Mr Johnson's decision to stand suggested the Conservatives were "turning inwards" and "jockeying for position in a future leadership contest". Labour and UKIP have already chosen their candidates for the constituency, which has been held by the Conservatives for decades.